For centuries, interior designers have prized the timeless beauty of fine wood. Now Sinks Gallery brings you a stunning collection of wood kitchen sinks, teak wood vessel sinks, and even wood bath and soaking tubs. The idea of a custom sink constructed of wood may surprise, but wooden farmhouse sinks, vessel sinks, and wood bathtubs have a long history of home use. They are truly beautiful, sustainable, long-lasting pieces at the height of luxury. 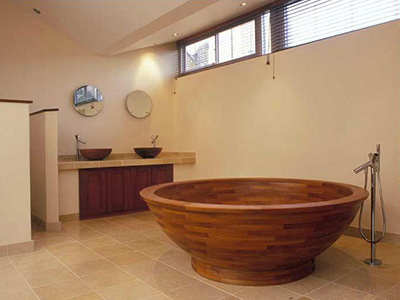 Wooden Baths and Sinks—Do they work?! After working in the plumbing industry for over 20 years I’ve seen just about every type of sink you can imagine. Several years ago, intrigued by some artisan-created sinks I’d seen, I set out on a quest to find high-quality artisan sinks that were functional and long-lasting. I started with glass sinks and GlassArtistsGallery.com and then expanded my search to other mediums—metal, stone, ceramic, and wood. The result of this journey is Sinks Gallery—the finest collection of artisan and designer sinks found anywhere in the world. The most difficult part was finding a quality wood sink that withstands the rigors of daily use while maintaining the richness of the material—it was truly a challenge! We have scoured the world to come up with our collection and can definitively answer the question posed in the title of this article—do they work? Yes, they do! Besides selling several wood artisans wood sinks, Sinks Gallery now includes our own teak sink collection, which is part of our SoLuna line of rustic and ethnic stone, wood, and copper products that include sinks, bathtubs, and lighting. To view other items in the collection, select Related Items from the product page. 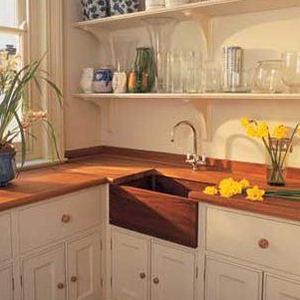 Teak wood sinks have been popular in the UK for over 40 years. In the early days, their sinks and baths were made from natural teak wood with no additional finishing. Teak is chosen because of its natural waterproofing properties—it has been used for hundreds of years in the marine industry for this reason—teak also has natural antiseptic properties, which is a bonus for use in baths and sinks. That first sink is still in use to this day, and the owners love it so much that they took it with them when they moved. One of the features of natural teak is that it darkens over time, which means that early teak wooden sinks are now quite dark in appearance but still as functional as the day they were handcrafted in the workshop. To address this issue, several organic teak oil finishes have been developed which successfully reduced the darkening of the teak and make the appearance of the wood baths and sinks distinctly more beautiful. To keep your teak wood sink properly maintained, simply clean and re-oil once or twice a year (depending on usage). SoLuna rustic teak wood sinks are made at the source in Indonesia. 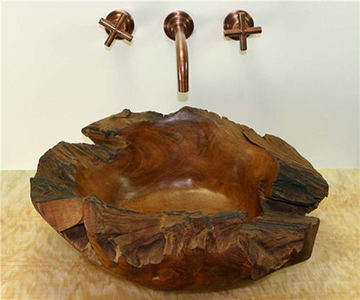 The wood that is used to craft these sinks is reclaimed from the teak lumber industry. While certain parts of the tree aren’t suitable for dimensional lumber, they are wonderful for our purposes. The rounded forms and unusual shapes and grains make this wood perfect for sinks, and for an amazing array of other products. It’s a beautiful way to make use of this by-product of the timber industry. Our rustic teak sinks come in a hand turned bowl version and in entirely natural shapes. The interiors of both are treated with an eco-friendly, waterproof finish to bring out the natural beauty of the wood grain. All woods darken over time, so you should expect that the color of your teak sink will change somewhat. The naturally formed sinks will darken on the interior, but as the outside has not been worked there should be less change in its appearance. Changes in color are actually desirable in natural products, as a patina indicates the surface is solidifying, which enhances the sense of longevity and permanence. Just like sinks made of any other material, SoLuna teak wood sinks do need regular maintenance. Clean your sink with a gentle soap and a soft cloth or bush. Avoid any kind of abrasive, whether in the cleaning tool or a cleaning product. To keep your sink looking its finest, we recommend giving it a light coating of teak oil four times per year. Click here to see our SoLuna line. 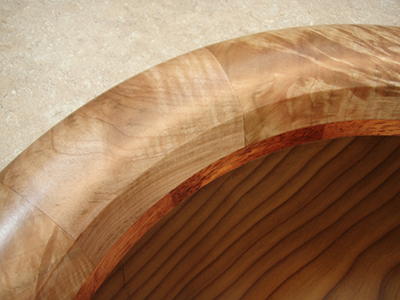 Gransee Designs specializes in making a unique top mount and vessel sinks from a wide variety of select wood. These utilitarian items become beautiful works of art which are warm and quiet. They are a focal point wherever they are used. The sinks are treated with a highly durable and stain resistant clear finish which protects and enhances the beauty of the wood. To protect the environment all lumber used is either plantation-grown or from reclaimed sources. Each piece of wood is hand-selected and only the most beautiful pieces are used assuring that each sink is a unique piece of art. Many times the most beautiful pieces of a tree are discarded either during harvesting or in landfills. This is some of the wood we use. After an initial selection it is cut and only then will we know what is inside. Finding and identifying suitable wood is difficult and time-consuming but is only the first step in creating these sculptures. Gransee Designs uses a state of the art, patented finish. This is an extremely hard, durable, stain resistant and waterproof finish that is locked into the wood. It took over two years to develop this 13-step process that takes several weeks to complete. The result is a sink that will take the rigors of everyday use and still retain its beauty for many years. A quick wipe with a soft cloth is all that is needed to keep these sinks looking new. No further maintenance is required. A gentle soap may be used but, like other modern sinks, avoid using abrasive cleaners. As with glass or stone sinks, wood sinks could be damaged by a heavy blow from a hard object, but with reasonable care, they will stay looking new for many years. Solid wood construction sinks are made from a single piece of wood. 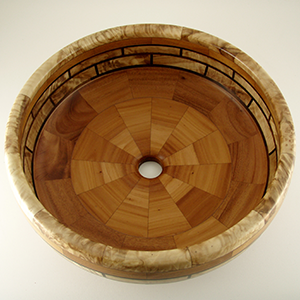 After the initial wood selection, it is cut into rough blanks, which are then turned on a lathe into a rough bowl shape. Extra wood is left for final shaping at a later time. At this point, the wood is green and must be dried before finish turning. Drying is one of the most important steps in the manufacturing process. If not done properly the wood can warp or crack making it unusable. Highly figured wood may have internal stresses which can move during drying so, after drying, each blank is inspected and any defective ones are discarded. The dried blanks are next turned to their final size and shape. Because of variations in the blank, the finished size of each sink may vary slightly. Each sink is an individual work of art and its final shape is determined by the wood itself. It is up to the turner to find the beauty hidden in the wood and release it. After another inspection, the sink goes to the finishing process which is followed by a final inspection. Laminated wood sinks are handcrafted from as few as two pieces to more than one hundred fifty individual pieces. Using kiln dried lumber; pieces are cut and laminated together. These pieces are cut again and glued into rings. The rings are then stacked on top of each other until the height of the bowl is reached. At this stage it is the equivalent of a solid, rough turned blank and is ready for final shaping and finishing. Some sinks are made using a combination of the two construction methods. These use a one piece bowl with laminated rims and accents. Careful pre-planning, design and wood selection is required to create these unique works of art. Precision cutting and fitting are needed to achieve perfect joints and symmetry. The process is difficult and time-consuming but the results speak for themselves. Dave Gransee has been involved in wood and metal working since an early age. At age 6 he had his own set of tools and started woodworking. One of his early projects was making doll furniture. By age 11 he had moved up to building go-carts and he has been building things ever since. His formal education was in tool and machine design. This gave him the ability to design and build the special equipment needed for the processes and products he has designed. Included are products from aerospace, automotive, sporting goods and, of course, wood products such as furniture, custom doors, and architectural items. In this plastic world, Dave truly appreciates the warmth and beauty of real wood and designs his products in an environmentally responsible way to protect this valuable resource.